Terra Forming Terra: Is The Fed's Gold Ponzi Scheme About To Pop? I have been tracking this story closely for the past several years, once I understood that it is completely possible to fabricate false gold bars using tungsten blanks covered with a rind of pure gold. That established the remarkable source of apparent open market gold during the last decade of the twentieth century. Since then any remaining good delivery gold has been shipped to the East until it too has obviously run out. Thus it is plausible to me that the USA has only the fake bad delivery bars left. Their unbelievable behavior certainly supports that. More unbelievable has been the utter silence of USA media on this while the German world is apparently having a media frenzy over this. This means quite simply that the problem is been studiously ignored here. The consequences of this will not be as dire as many claim. After all, Canada sold all its gold a long time ago. Countries simply do not need gold. Better yet, most gold is mined globally and driving that sector is very much in Western interests. The US Dollar could crash at a finger snap under at least one circumstance: if the gold holdings at the Federal Reserve Bank of New York (NY Fed) are revealed to be missing. An event last week made that circumstance edge a bit closer. Austria wants to audit the 150 tons of gold it stores in the UK (some sources say 280 tons.) According to Austrian Trend magazine, “there is a rising disbelief among Austrians about the existence of the gold." If the bullion is not there, then a flood of audit demands could reveal empty vaults around the world. But particularly in one place. A disproportionate percentage of the world's gold reserve is in the vault of the NY Fed. Or, at least, the physical gold is said to be there. A recent delivery of repatriated gold to Germany is reason for skepticism. Or, rather, the website used to offer that assurance. A few months ago, the Fed returned melted and recast bars to Germany, not the original ones that had been stored. The link to the former message now leads to "page unavailable.” The page may have been eliminated due to unwanted attention created by a blogger who noted the discrepancy in the Fed's policy and what it delivered. A 1968 memo discovered and published by the financial iconoclast Zero Hedge in 2012 explains the need to return the originally deposited metal. The memo exposed a conspiracy between the Bank of England and the Federal Reserve “to provide the Bundesbank [German central bank] with what both knew was 'bad delivery' gold...amounting to 172 bars.” The 'bad delivery' consisted of returning gold to Germany that was below the standard of the gold deposited. Now alarm bells are ringing over the possible absence of gold. In 2003, confidence was shaken by an announcement from the Bank of Portugal. 433 metric tons of gold -- approximately 70 percent of its gold reserve – had been lent out or swapped into the market. International banking analyst James Turk commented in the Free Gold Money Report, “[I]n either case...this gold is no longer stored in this central bank's vault and...no longer available as a monetary reserve.” Yet the policy of the International Monetary Fund is to count loans and swaps as reserves. Turk asked, “How can that be? How? Gold reserves are not audited by objective sources ... when they are audited at all. Moreover, the IMF needs to prop up confidence in a shaky web of central banks. To the banks and the IMF, the bookkeeping is all that really matters. Even the Bundesbank seemed content to enter numbers into forms and never check on the physical gold in the NY Fed. That is, the Bundesbank wascontent until a German federal court ruled that it must conduct annual audits and inspections of Germany's gold reserves worldwide. Also in October 2012, Germany announced an intention to repatriate 300 tons of gold held by the NY Fed by 2020. The deposit has not been audited since 1979. The German public was clearly worried about whether there is allocated gold at the NY Fed or whether Germany is just one of many creditors on a metal statement. The German people lack confidence in the US. They are skeptical about the US government and the Federal Reserve's ability to protect the value of its own dollar, they look askance at its poor track record in fiscal and monetary policy, and they doubt that the Fed has kept proper track of the gold it lends out. The investment advisor site The Day Trading Academy described what happened when German accountability met the NY Fed. “The Federal Reserve Bank of New York...had excuses why representatives from the Bundesbank would be unable to see German gold. The response from Germany was not flattering. Accusations of corruption and dishonesty soon followed. 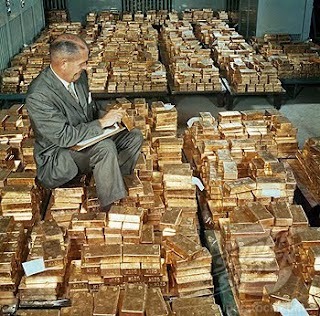 After a rash of negative international reactions, the Federal Reserve finally agreed to give back over 600 tons of gold, but insist [sic] it will take until 2020 to be able to achieve this task.” Two other German delegations were each shown “one representative gold bar” and were not allowed to enter the rooms in which the rest was said to be stored. By January 2014, a year after the original Bundesbank demand, the NY Fed had returned only 5 tons of the German government's gold. Again, the bars were not the original ones. German media ran wild with the allegations that the Fed took so long to return so little because it has insufficient gold in its vault. There is almost certainly a dearth of physical gold in the vaults of either America, the UK or both. If so, then a run becomes likely because first-comers stand the best chance of repatriating wealth. Not all will succeed. The Italian government is the world's third largest holder of gold, after the US and Germany. The Banca d’Italia recently revealed that approximately half of its reserves is at the NY Fed ... or allegedly so. The losses will be huge and not paper ones. What happens to the US dollar when America's vaults are seen to be as empty as its promises and moral fiber? It will crash and the suffering of average people will be terrible. The good news: privately held gold will soar. And it will be ever more important for such gold to be just that...held with privacy. Wendy happily takes your comments and questions at The Dollar Vigilante. Join us today! Wendy McElroy is a regular contributor to the Dollar Vigilante, and a renowned individualist anarchist and individualist feminist. She was a co-founder along with Carl Watner and George H. Smith of The Voluntaryist in 1982, and is the author/editor of twelve books, the latest of which is"The Art of Being Free". Follow her work at www.wendymcelroy.com.